Drin Drin ed eccoci qua. Pronti con un paio di news tanto per ricapitolare a che punto siamo. Rilasciato ScummVM 1.9.0 con una versione potenziata del motore, un miglior supporto per le piattaforme mobile e potenziamento del supporto di localizzazione linguistica attraverso il nuovo portale. Detto questo vi rimando al messaggio originale. Our one month testing period is over. Thanks to a lot of help from you, our fellow users and testers, we are now ready to ship our next release. As always, we have been busy adding more games and enhancing old ones. Now, after many years in production, we are proud to announce support for Myst and Myst: Masterpiece Edition. Besides that, we now support U.F.O.s and the early Sierra Hi-Res adventures, namely Hi-Res Adventure #0: Mission Asteroid, Hi-Res Adventure #1: Mystery House and Hi-Res Adventure #2: The Wizard and the Princess, for a total of six newly supported games. With this release we are switching to SDL 2, so please, report any bugs you encounter. Last time we introduced Sparkle-based updates for Mac, and now we’re trying to launch it also for Windows. Hopefully, you will see it in action once we release our next version. Once again, we would like to mention that auto-updating is selected as an opt-in during your first start up. By default, if you enable it, it will check weekly for new releases. Screenshots of this in action can be seen at the WinSparkle website. Notable bugfixes and enhancements include Hercules rendering and font for the AGI games, numerous bugfixes to SCI games, enhanced Sherlock games experience, and AmiUpdate on the Amiga port. The full list of changes included in this release can be found in the release notes and the binaries are provided on our downloads page. Wait no more, and start playing Myst or U.F.O.s right now! Until now, translating the ScummVM software was not straightforward. Contributors had to get the translations template file to their computer, update the translation using a dedicated application, and then propose the updated translation to the ScummVM team using a Pull Request or our bug tracker. 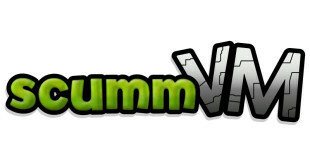 The ScummVM team itself also had some manual tasks to perform, such as updating the translation templates from the source code when needed or rebuilding the binary translation file after receiving a translator’s contribution. All this belongs to the past. Now, thanks to our new translations website, powered by Weblate, updating the translations is easier and more comfortable than ever before. Translation templates are updated automatically when needed, and so is the binary translation data file. Translators now just have to translate. That’s it. The website also helps translators by performing automated quality checks and suggesting (machine) translations. Finally, the new site also adds a community aspect to translations, enabling users to vote for suggested translations and even make their own suggestions. Anybody can view the translations, but you will need to log in to make suggestions, comment, and vote. You can log in using your GitHub or Facebook account, or by creating an account on the website. You will still need to contact us if you want to contribute further (for example to start a new translation or help on an existing one), as we will need to grant you access to the Translators group. Unlike regular users, translators can accept or reject suggestions and modify translations directly. Contact us by visiting the #scummvm IRC channel on irc.freenode.net or by sending an email to translation@scummvm.org if you are interested in becoming an official translator. Otherwise, head over to https://translations.scummvm.org/ now, and help us make ScummVM accessible to everyone. Quindi per coloro che volessero collaborare è possibile contattare lo staff o usare anche il nostro portale al fine di poter eventualmente collaborare con questo meraviglioso progetto. Detto questo stay tuned per altre interessanti notizie.